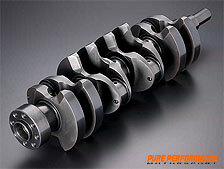 The Pure Performance Motorsport crankshaft is made from shaving and has flexibility in a design as compared with a forge product. 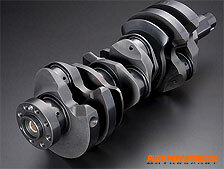 A crankshaft designer can determine form satisfactorily. The PPM BILLET CRANK SHAFT is a genuine crank shaft with both the counter weight of ideal form and the excellent balance. 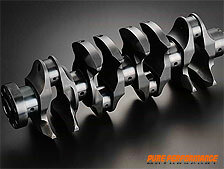 The PPM crankshaft made from shaving has flexibility in a design as compared with a forge product. 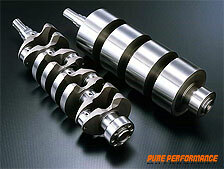 A crankshaft designer can determine form satisfactorily. 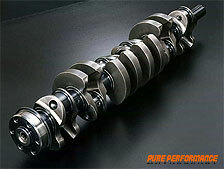 The PPM BILLET CRANK SHAFT is a genuine crankshaft with both the counter weight of ideal form and the excellent balance. 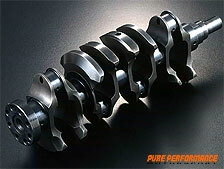 A crankshaft is a part which receives bent vibration and twisted vibration by explosive pressure and return inertia force, therefore a crankshaft should keep its strength for corresponding these conditions. 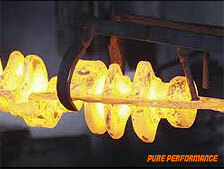 This matter should be especially needed in the tuned engine with high power. But improvement of strength becomes to decrease response of engine if to add more fat without consideration. Both strength and lightness are realized by performing stress analysis. 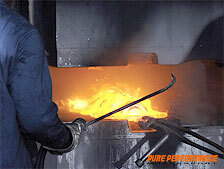 SCM440 is used as a material and processing corresponding to the material is performed. 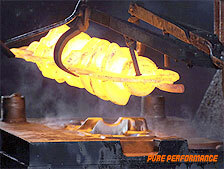 It has both strength and lightness by giving heat treatment and a special surface treatment. In order to rotate a crankshaft smoothly, the accuracy (The degree of a true circle, and surface roughness) of a pin journal becomes important. 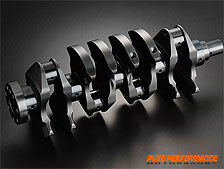 The crankshaft which polish finished pays careful attention to the degree of a true circle, the surface roughness, and transformation etc... and is wrapped. After a finishing surface treatment, it is wrapped and a friction loss is made into the minimum. Even if it is the weight form in which the rate of balance is excellent however, when the balance of the whole crankshaft is bad or bent, vibration occurs. Dynamic balance adjustment and bend correction were performed and the cause of vibration as much as possible is eliminated. Since the portion which is distant from a rotational center (journal center) in order to make weight light is removed, the rate of balance falls remarkably. It is got larger effect to have arranged weight in the position which is distant from a rotational center (journal center) when weight is the same. Therefore, the superfluous flesh near a rotational center as much as possible is remove.